America’s Black Holocaust Museum was founded in 1984 in a Milwaukee, Wisconsin storefront by Dr. James Cameron, the only known survivor of a lynching. In 1988 Cameron acquired a spacious free-standing building, where the he expanded ABHM’s exhibits and employed staff. The museum attracted many local, national, and international visitors. Many took guided tours led by “griots” (docents) who interpreted the exhibits and facilitated dialog. Dr. Cameron also spoke daily with most visitors about his survival experience – making for a very special encounter with living history. His passing in 2006 combined with the country’s economic downturn forced the museum to give up its building in 2008. On February 25, 2012, ABHM came back to life as a unique, cutting-edge, interactive, virtual museum. This 21st century, cost-effective format makes ABHM available to people around the world who would otherwise have no access to its information and resources. 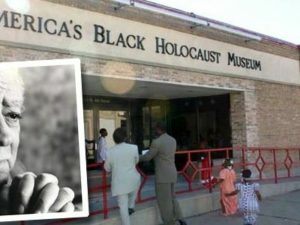 ABHM also installs temporary exhibits in public and university buildings in the greater Milwaukee area. Scholar-griots from around the world have begun curating exhibits for ABHM. The virtual museum is still in its infancy, but exhibits are added every week.